Bring the Books: Nobody Expects Kool-Aid or the Spanish Inquisition! 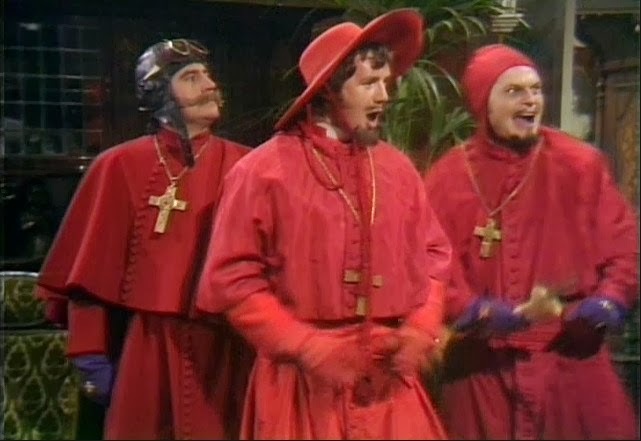 Nobody Expects Kool-Aid or the Spanish Inquisition! Let's pretend we live in a world where there is a group of people who think that drinking Kool-Aid is a moral evil, and let's assume that this is a deeply held belief for these people. Let's also assume that they believe that it is a moral evil even to help someone else drink Kool-Aid. And let's also assume that part of their deeply held religious belief is that God will judge them if they do these things that we've just spoken of. In this scenario, these Kool-Aid abstainers have a moral compulsion to abstain from something: namely, the drinking or helping others to drink Kool-Aid. Along comes Kool-Aid Man, and he wants Kool-Aid. "Oh yeah! I want some Kool-Aid! Fill me up, Kool-Aid Abstainer!" "Please, sir. Go to another vendor. If I help you get this substance, I'll be in violation of what God has told me to do." "Oh no!" says Kool-Aid Man. "I'm an open-minded and tolerant man. In the land of Kool, they teach us to be like that. That being said, I will only drink Kool-Aid if I can get it from you." "Please," says the Kool-Aid Abstainer. "If you make me do this thing, I believe I will be judged by God!" In this scenario, maybe you think Kool-Aid Abstainer is a nut job and a bigot. And perhaps he is, for all we know! But what kind of person does Kool-Aid Man have to be to actually make this vendor give him something when he knows that Kool-Aid Abstainer thinks it is morally wrong for him to do so? The question is not whether Kool-Aid Abstainer is misguided or unkind. The question is, if Kool-Aid Man could go somewhere else, why doesn't he? You can judge Kool-Aid Abstainer all you want (plenty do! ), but at the end of the day, Kool-Aid Man's conscience is not violated by Kool-Aid Abstainer's unwillingness to oblige him. In fact, if Kool-Aid Man is a respectful, open-minded, tolerant person who cares about the conscience of his neighbor, he should find another place to get his Kool-Aid. Perhaps Kool-Aid Man justifies his insistence by claiming that it's his right, and maybe it is, according to the magistrate. But it says something about Kool-Aid Man that he would force Kool-Aid Abstainer to oblige him: namely, he believes that his own desires are more important than what he is doing to Kool-Aid Abstainer's conscience. When modern people look back at the Spanish Inquisition, there are particular things about it that they find deeply offensive. But perhaps among the most offensive is that these authorities forced people to say and do things that were against their consciences. They forced them to lie. They forced them to recant deeply held religious beliefs, and they did so by the forceful and coercive hand of the state. 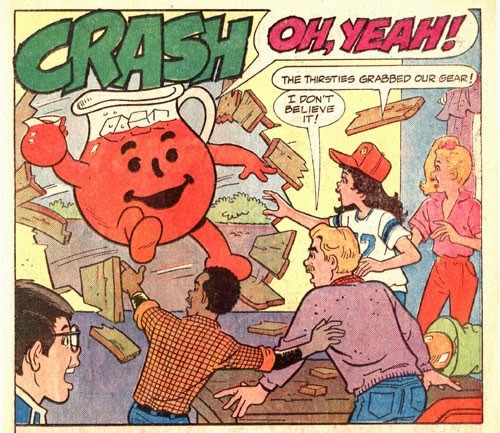 It is not a stretch to say that Kool-Aid Man, as open-minded as he claims to be, and as tolerant as he likes to think of himself, has no respect for Kool-Aid Abstainer. In point of fact, Kool-Aid Abstainer has never asked Kool-Aid Man to do something wrong even in all his years of prohibiting Kool-Aid Man from drinking his favored substance. It is one thing for a person to be prevented by the magistrate from doing what they want to do. It's quite another to use the same magistrate to force the other person to do something that that person doesn't want to do for moral reasons. Meet Kool-Aid Man... the new modern Inquisitor. I'm trying to get the parallels to the cake-making issue but having trouble. The cake-makers are already making cakes, but these Kool-Aid people are anti-Kool-Aid in every form. They would have to be making Kool-Aid in the first place (and refuse to serve it to Kool-Aid Man for some other reason?) for this to make sense...? Thanks for the question, Echobase77 (by the way, we like people to use their real names on our blog). This above illustration is actually meant to highlight the notion of compelling someone to go against their conscience, not to explain goods and services and where they come from. It just shows the limitations of choosing any one illustration to try to make one's point, I think. However, there will be a novelized form of this story in paperback early next year where every aspect of Kool-Aid Man and Kool-Aid Abstainer's story will be worked out in painstaking detail. Stay tuned! By the way, who said anything about cake making?? ?